Once you have assembled a board (assembly instructions for HVPS) and placed it in an enclosure (assembly instruction for the full enclosure), you need to configure it and calibrate it before it can be used. The drivers and the LabVIEW user interface or Python user interface must be installed on your computer. For the SHVPS to work correctly in single-channel mode, the jumper h5V must be in the on position. The header H2 can be changed depending on your usage, but the GUI requires this jumper to be on the Onboard position. Get the most recent firmware from the Download page (shvps_x.zip, where x represents the version), and decompress it on your computer. The High Voltage enable switch (S2) must be in the off position. Connect the SHVPS to your computer with a micro-USB cable (the power adapter can be used, but is not required at this stage). Using the Arduino IDE, compile and upload the code to the microcontroller (see HVPS drivers for more information). 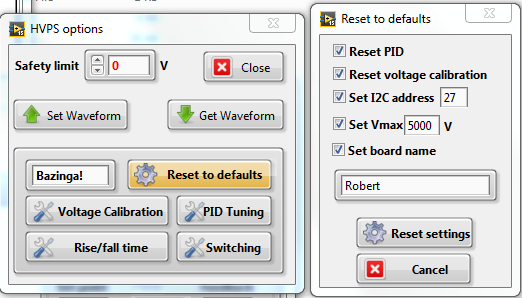 To perform the required initial configuration, you can either use the LabVIEW interface (see 2.1), or you can use a simple command (see 2.2). The second solution is useful if you intend to use the Python interface, and do not want to install the LabVIEW interface. Connect the 6 VDC power adapter to the HVPS. Connect the HVPS to the computer with a micro-USB cable. In the GUI select the tool icon (Access HVPS configuration options) at the top right of the window. 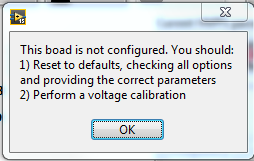 In the Dialog box that opens, check all of the options. Enter the value of the I2C address attributed to the HVPS (as defined on the assembly test sheets), the voltage rating of the HVPS, and the name of the board. The main window should display the name of the board (red rectangle). The maximal voltage indicated on the setting dial should correspond to the voltage rating of the HVPS (blue rectangle). You can display the parameters saved into the memory of the HVPS by pressing on the content of the HVPS memory button (green rectangle). 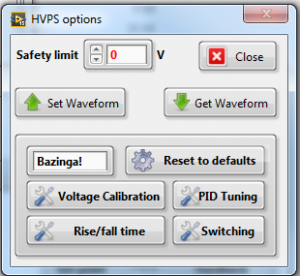 The HVPS is now ready to be used (refer to the GUI manual), but for better accuracy, it should be calibrated first. Enter the command Conf XXXX where XXXX is the voltage rating of your board, in order to automatically initialize the HVPS. XXXX must be one of the 5 standard voltage ratings described on the website (5kV, 3kV, 2kV, 1.2kV, 500V). Specifically, the parameters initialised are indicated below. They can all be modified using the serial commands. Name of the board to MyHVPS. Can be changed with SName command.